Till about a month ago I hardly ever had spare milk after 4 members, tea, curd setting etc. But lately I have about 1 –1.5 litre spare every week. I think I need to reduce it. But after Diwali. So keeping in tradition of making Indian sweets for Diwali, I decided to use up this milk by making Rabri. 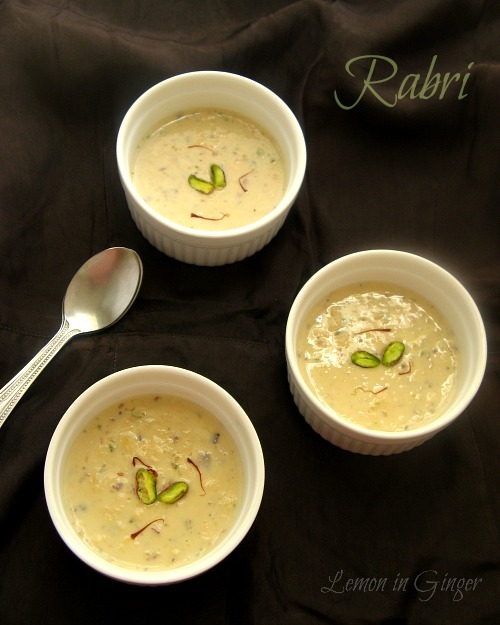 Rabri is a sweet made from evaporated milk and little dry fruits. Quite simple to put together. 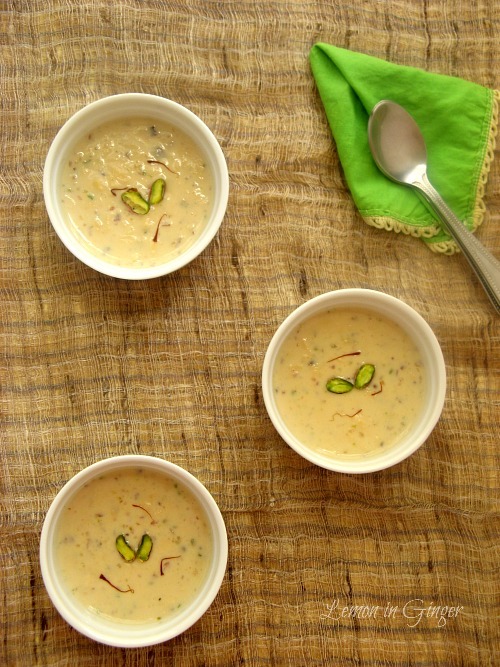 It is similar to Basundi and Khurchan – the only difference is in the consistency. If it is thinner than Rabri but you still eat with spoon it becomes Basundi and if it is thicker than Rabri and is lumpy, it becomes Khurchan. Khurchan literally means scrapping from the vessel. The food that sticks to the side of the cooking vessel and needs a bit of scraping and is thick. It is usually very slightly burnt. 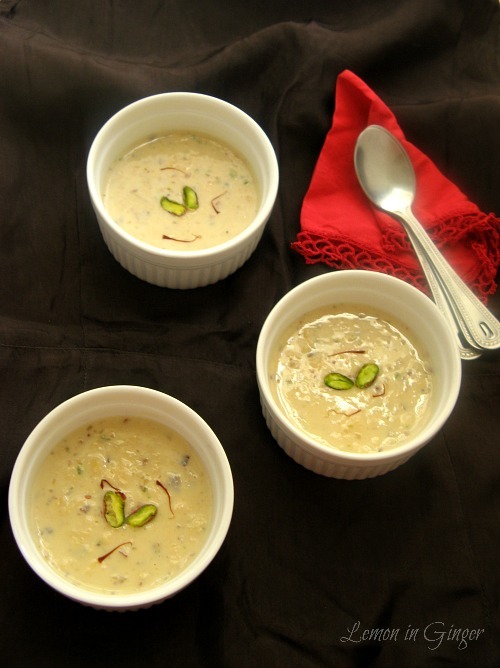 I love eating khurchan not just of sweets but of many other dishes like ‘Kadhi’. 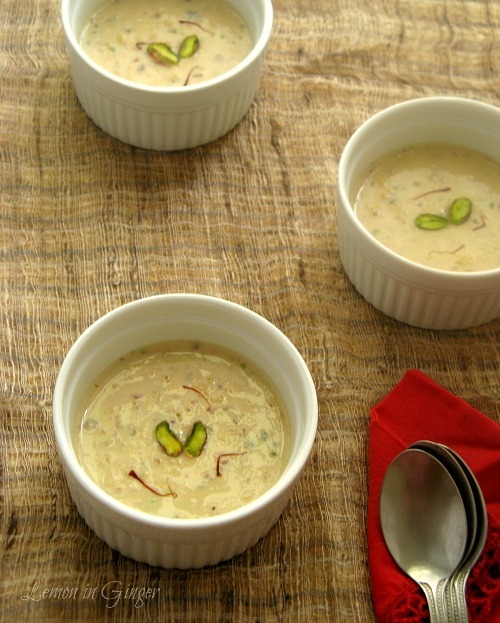 Rabri is a simple dessert which is rich and tasty. Being a North-Indian it is has a special place for me as we are brought up on rich creamy sweets. Wishing you a very Happy and Joyous Diwali with this yummy traditional sweet. A rich dessert made from evaporated or reduced milk. It is enriched with dry-fruits. It is perfect for cozy winters. In a thick bottom vessel, boil milk on slow till it reduces to half. Continue to stir in between to avoid burning the milk. In the meanwhile, finely shop or crush all the dry fruits, except saffron. You can pulse twice also using the mixer jar. When the milk has reduced add all the crushed dry-fruits while stirring. Allow it to cook for another 1-2 minutes. Add sugar and give a complete boil. Add saffron threads. Remove from flame. Serve hot, warm or cold. I served chilled. It thickens upon cooling, so if you do not like thick or rich, reduce the amount of cashew & pistachio by half.